Mass Teddy’s son, Cecil and two of his nephews, Valdie and Rennie had emigrated to England. The story of what would prove to be an eventful year, now continues…. Mass Teddy, whose occupation was now listed as a cultivator, had not become the millionaire that he had hoped and hadn’t seen the 1751 will that his son Cecil had managed to track down in the United Kingdom. In January 1956, Mass Teddy didn’t feel well. he had developed what appeared to be a heavy cold which could not be shaken off. He went to bed aided by an unusual concoction of Rum and Salt! At his Great House, during the night of the 20th January 1956, Mass Teddy could be heard from his room, groaning in bed. His life came suddenly and abruptly to it’s end as he died in the arms of his son’s wife, Phyllis Hodgson. He had suffered an aneurysm of the aorta, a severe haemorrhage of the heart. He was heard groaning in bed through the night. Telephone Conversation 3rd September 2003, with Ciseline Powell née Hodgson, grand-daughter of Mass Teddy. Was the cause of his death attributed to his lifelong hard-drinking, or was it a natural death? I have searched for many years, looking to find a newspaper notification of his death, but no such report of an obituary can be found. It seems to appear that none was written? Cecil was in England, Mae, Maurice, Linton and Hortense were all in America, so missed their father’s funeral. Mass Teddy was laid to rest on his private lands at the Hodgson Family Burial Ground, Southfield Pen, beside his late wife Mabel who had predeceased him eleven years earlier. With both his mother, Mabel and father Mass Teddy, now deceased, the youngest son, Leslie Hodgson – who had neglected to move to America in 1945 – became a ‘Jamaican Gentleman’ when he took over the ownership of his father’s estate and belongings, which included the Great House, Southfield Pen and all the animals that his late father had owned at the time of his death. Leslie would go on to own the estate for the next 40 years. We now skip across to England…. Valdie and his brother Rennie, were still in lodging’s at Langley with their Uncle Cecil and were both well settled workers at Tube Products, Oldbury. My dad’s occupation there was a Tube worker, where he worked amongst the crane hoists as a slinger, in the slinging section of the factory. Sometime during the period of January – March 1956, dad’s brother, Valdie became the first ‘Southfield Hodgson’ ever to marry in the United Kingdom, when he married his Jamaican partner, Rhema Clarke at Oldbury Town Hall, Register Office. In the same department where my dad worked at Tube Products was a fellow Jamaican man, older than him, who one day overheard the name ‘Hodgson’ mentioned. He asked my dad “You are not by any chance related to one Mr Cecil Hodgson?” “Yes, I am his nephew” came dad’s reply “He is a perfect gentleman. If you are half the person of him, then you are welcome in my family. The man, who lived in West Bromwich, near the town centre, told my dad with tongue in cheek “I have about 100 nieces. You can pick and choose from them” This man was none other than, Everett Ebanks, the friend who had sailed to England with Cecil Hodgson onboard the Georgic in 1951. Everett and Cecil had also lodged together a few years earlier at Rotton Park Road, Edgbaston. At West Bromwich, Everett had Jamaican relatives, including nieces living with him. About a week after dad had been invited to his home, he took up Everett’s offer and travelled about two miles by bus from Langley to West Bromwich. There, my dad came into contact with the Ebanks family at Everett’s home, 36 Beeches Road. 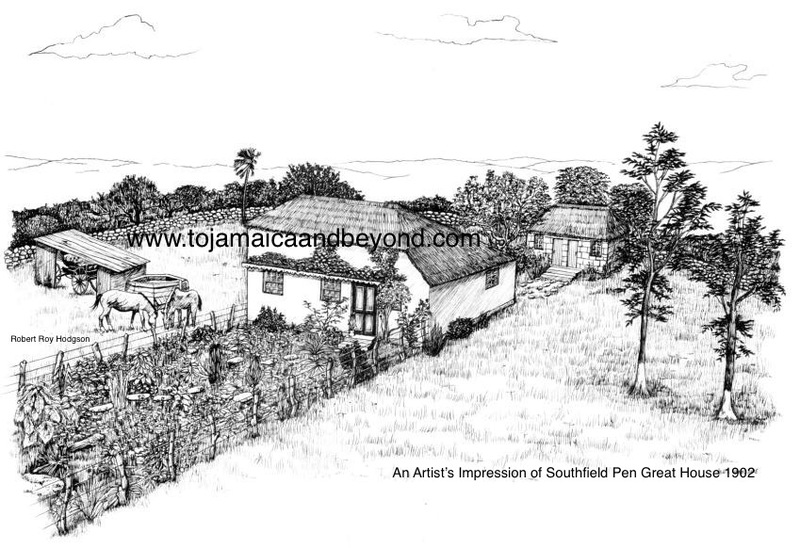 Many young Jamaican immigrant’s, new into England, looked to settle down quite quickly. At the beginning of 1956, dad soon began courting a member of the Ebanks family. In fact, a marriage was being planned for the August but the relationship broke down. Now a single man again, towards the end of March 1956, dad was invited to the wedding of Glenford Ebanks and Margaret Ivorine Trenchfield, who were formerly of Flagaman, Saint Elizabeth (near Southfield.) They too, also worked at Tube Products. Glen was a relative of Everett Ebanks. By the time of their wedding in the March 1956, my mother, Ivorine Colberta Ebanks had just arrived in the UK from Jamaica. She was a relative of both Glen Ebanks and his new wife, Margaret Trenchfield. Mom came from the same district, Flagaman in Jamaica. After the wedding ceremony was over, everyone went back to Everitt’s house in West Bromwich for the after wedding party reception. This was when mom and dad first met, March 1956. My dad spoke about when he first saw mom “Many of the Ebanks family, who were new to the country, were mad on reading a comic called the Beano. “They were all reading it in the house” “When I first spoke to your mom, she was in a two-piece dress and was reading the Beano and threw it at me” I said to her “You carry on, I will marry you one day” “Not over my dead body” came mom’s reply! Mom Read The Beano Comic In 1956. Her Children Read It In The 1960’s! About one week after Glen Ebank’s and Margaret Trenchfield’s marriage, my dad appeared as a best man to a friend’s wedding. The after party was held at Bagnall Street West Bromwich, an adjoining street next to Everett’s. Later on that night, he went back to the party. Mom was there and said to him “That walk, I really fancied you from that walk” “We then arranged a date at the pictures, the King’s Cinema, Paradise Street, West Bromwich” he said. They would marry the following year. That was it, that is how my parent’s met in West Bromwich 62 years ago. Let’s now travel 5,000 miles back to Jamaica again, hope you are not getting dizzy with all this moving around! At Southfield was Mabel’s surviving sister Mrs Dorcas Antoinette Speid. Dorcas was my 2nd great Aunt. I believe, that my dad’s sister, Aunt Cissy lived with her at this time. Everyone at Southfield knew Dorcas, especially as she was the wife of the well-known teacher and much respected Reginald Speid of Waldasnor Estate, Southfield. Dorcas and Reginald taught at Mayfield School, Southfield. Amongst the many other things that she was involved in, Dorcas helped to establish a ‘Mothers Union’ at and was a very prominent lady, at the heart of everything good that occurred at Southfield. She and her husband Reginald Speid were the heartbeat of Southfield. On the 13th September 1956, Dorcas sadly died of Cancer. The exact cause of her death was “Cancer of Calcium” resulting from “Metastasis of the liver” (tumour of the liver) The death left her husband Mr Reginald Speid, a widower. Dorcas’s burial took place at the local Southfield Anglican Church, Saint Mark’s. She was 68 years of age. When I visited Southfield in 2004, I stayed with the late Stafford Bent, a relative that I had never met before. Stafford was a gentle and nice hospitable man and a very hardworking farmer. He was nephew of the two sister’s Dorcas and Mabel. Whilst I was staying there, Stafford’s nephew, Glen Wellington, took me on a most delightful walk around the area. He walked me over Dorcas’s lands, showing me the sparse remains of Dorcas and Reginald Speid’s former home that had burnt down in 1990, at the time of the first gulf war. Glen provided me with an unforgettable experience walking me around my ancestors lands, and telling me stories to accompany the walk. It really was thrilling. The Only Remaining Structure Of Dorcas and Reginald Speid’s ‘Waldasnor’ Property Which Was accidentally Burnt Down In 1990. Photo August 2004. This four-part blog finally closes in America…. By about 1956, Mae and her family had moved out of their Manhattan home (where the lock of hair had been stolen from) The New York Hodgson’s, Mae and her younger sister Hortense brought a house together at 931 Lincoln Place, Brooklyn, New York City. In the 1950’s, my grandmother, Mae and Aunt Hortense brought a home together, 931 Lincoln Place, Brooklyn, New York City. Telephone Conversation 2003 with Gairre Henry, grandaughter of Mae Burkley née Hodgson. The photographs – contained in a small pocket album – were mailed overseas to their brother ‘Johnie’ Hodgson who lived in Kingston, Jamaica. The Back Of The Pocket Album. Willougbys, New York City. “I hope you enjoyed reading this as much as I enjoyed writing it. This blog has touched upon four events in my family history that greatly interested and intrigued me, the death of Mass Teddy, how my parent’s met, the death of Mabel’s sister Dorcas and the Hodgson sisters Mae and Hortense buying a house together in New York. When my dad first sent me that old black and white portrait of Mass Teddy and Mabel, I thought they looked like a couple that were heading for a wealthy future together. I found it sad as I delved further into Mass Teddy’s life, discovering that he drank so much to excess. I don’t condone what he did, but as I read into the history of alcohol, I quickly understood that Mass Teddy came from a generation where many Jamaican men, especially those of wealth that owned estates, drank rum. He could have went down a different path, but succumbed to the dreaded alcohol from his teenage years and never stopped. I had to tell his story, maybe it is not good to read, but it is part of our history. When I researched into Mabel’s sister, Dorcas, I soon discovered how intelligent and influential she was to the inhabitants of Southfield. She was very strict but educated many Southfield children and helped them to gain good foundations which in turn helped them in their future lives at home and abroad. It fills me with pride to know that her legacy still lives on at Southfield even today. The piece about Mae and Hortense’s new home, was first inspired by my visit to Southfield in 2004, when I discovered the quaint little Willoughby’s photo album amongst Cecil Hodgson’s possessions. It was only a few years after the 911 attack that took down the Twin Towers in New York. It intrigued me seeing all those tall landmark buildings on the front cover. How the world has changed since those photographs were taken about 1956! The article that covered how my parent’s first met was recounted to me by my dad Renford Hodgson only a few weeks ago on Sunday, 15th April 2018. I didn’t know how my parent’s met, I wonder why I never asked them? Although my mom and dad later got divorced in the 1980’s, it was still thrilling to learn about how they first met” And yes, I loved the Beano too! Robert Roy Hodgson. That must’ve been quite some walk your dad had! Lovely post, Robert. Thanks. It sure was an effective walk Val, it certainly had a desired effect! Another well researched and documented glimpse into our history. Thanks Carol, glad you enjoyed it. More to come soon. How are you progressing with your DNA?